When it is time to renovate your school or library, one aspect that can make the most difference in comfort and design is the flooring. Flooring can also affect the well-being and wellness of everyone in the library or school, from the staff members to the young children. Additionally, the flooring will make a large impact visually to all who enter the public or private facility. Here are 4 reasons why carpet tile is the perfect choice for your school or library project. Acoustic Benefits – Libraries and schools are places for children and adults to interact, often in a learning or class setting. These larger open spaces tend to reverberate sound from group discussions, have heavy foot traffic, and have minimal dividers or walls. Therefore, it is essential to consider the acoustic properties of your carpet tile selection to diffuse noise and minimize the sound of foot traffic. Direct Flooring will help you navigate choices and assist you in selecting the right carpet tile choice for your room size, design style and budget. 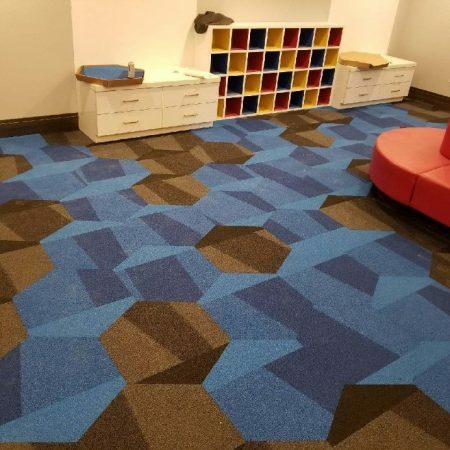 Antimicrobial Flooring – Elementary schools and community libraries often host events for mothers with small children and as a result, people may be playing and sitting on the floor. In libraries, staff will also need to kneel to restock books at lower height shelves. When selecting a carpet for this condition, it is important to select a carpet tile that comes with an antimicrobial treatment. They protect the carpet from bacteria and other microbes. Also, this treatment helps prevent mold and mildew from growing on the carpet tiles surface. Mold and Mildew Prevention – Although antimicrobial treatments in the carpet tile for your library or school protects against mold and mildew growing on the surface of the tile, it is not specifically designed to ward away mold or mildew growing underneath the surface of your carpet. In libraries this is a major concern, especially if you have ever smelled a musty older public library or school. Books often provide an active place where mold spores can start and grow. Moisture can travel through the subfloor or concrete from outside areas. And once the mold spores start, it can spread throughout the building. Carpet tiles with open cell cushion backing can mitigate the spread of mold and mildew under the tile, and could be a great choice for this situation. Design & Aesthetics – It is important to address the various types of carpet for various conditions; the design element is most often the top reason a carpet is selected. Carpet tiles need to last a long time, wear well and have a certain look to achieve the right match for the furniture, paint, fixtures and overall environment. Direct Flooring is your total resource to find and select the right carpet tile for your library or school. Our selection from the world’s top manufacturers means you will get a great product, at a great price, with world class service and some of the best warranties in the flooring industry. We have an extensive library and can bring samples to you or you can visit our showroom (by appointment) and meet with one of our expert flooring technicians. 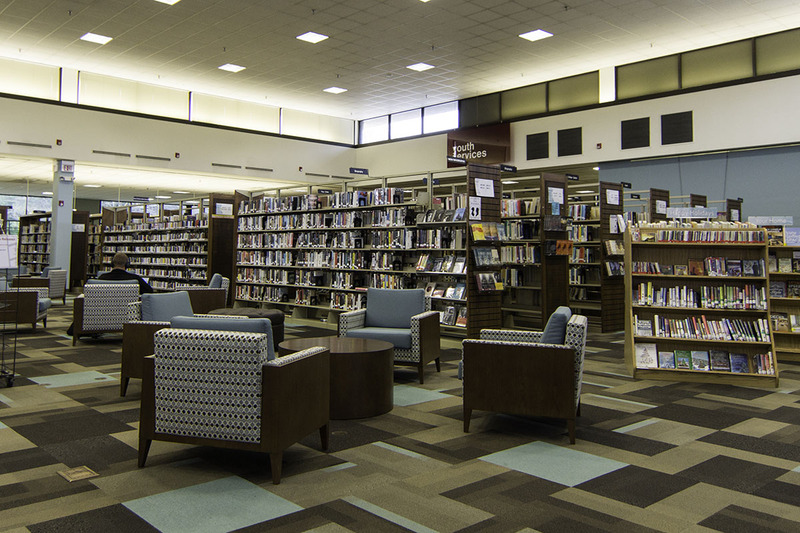 Direct Flooring is equipped to manage the flooring process for your school or library. We are a NJ State Contract Vendor and have experience to help you design and renovate the flooring with minimal disturbance to the facility. Direct Flooring specializes in commercial flooring products and services throughout the tri-state metro area of NY, NJ and PA. We provide and install hardwood, carpet, resilient and ceramic tile for mid-rise luxury apartments, municipal projects including libraries and schools, and luxury apartments throughout the tri-state area. For more information on how to obtain a bid from Direct Flooring, contact Frank Gomes at 732.241.0232. He is Direct Flooring’s New Jersey State Contract Specialist and can also be reached by email at fgomes@dfemail.com.